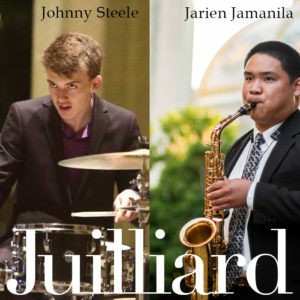 IAJSD Students Johnny Steele and Jarien Jamanila accepted to Juilliard! 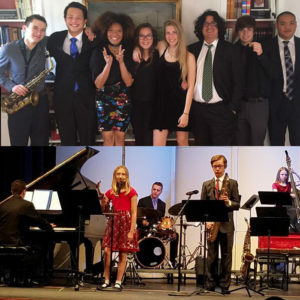 We are so excited to report that two of our students, one current, one former, have been accepted to the very elite Juilliard Jazz Program in New York City under the direction of Wynton Marsalis. It has been a real pleasure to watch 16 year old Johnny Steele, drummer in Gil’s 9am class, apply to colleges this year. He is a junior at The School of Creative and Performing Arts but will be graduating a year early to pursue his dream of studying music. He was able to get all his credits to graduate early by attending summer school. He applied to all the top Jazz universities and conservatories. To apply he had to submit prescreening audition videos. We all held our breath as he waited to hear which college had accepted the prescreening and wanted him to come in for a live audition. University of Miami Frost School of Music wanted him to come in! USC wanted him to audition! Also Manhattan School of Music! Berklee School of Music accepted him right off the bat and even offered him a nice scholarship. And, of course, Juilliard was interested as well as the New School, both in New York City. Johnny and his parents Jen and Scott took a one week trip to New York. Johnny had auditions scheduled for Juilliard and the New School. Johnny had been practicing around 4 hours a day back in San Diego to prepare for these auditions. He even located practice rooms in New York so he would be ready. The big day came and the Steeles went to Juilliard to audition along with many other hopefuls. Johnny auditioned and then had to wait an hour or so to see if he had made the first cut. A list was posted on the wall. Students checked the list – some walked away cheering, others walked away with shoulders slumped, their dream not realized. Turns out Johnny was one of eight drummers they were considering for 3 spots. Jarien Jamanila has an equally amazing story of his path to Juilliard. Jarien graduated from The School of Creative and Performing Arts last year. 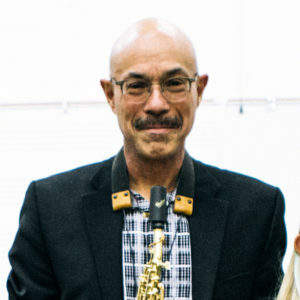 He was the sax player in Gil’s IAJSD combo for 2015-16. Last year he submitted a prescreening audition video to Juilliard and we were so thrilled when he was asked to come in for a live audition. We were all really pulling for him because he is such a sweetheart and so talented. Well, he came close, but in the end he was not accepted into the program. He loved the Juilliard program and still had faith that he could make it. He spent a year going to classes Grossmont College and practicing his sax every day. His hard work and faith paid off. He audition again this year and was offered a spot in the program! These young men are so talented and work so hard. They are both so deserving of this honor. We are thrilled that they are going on to greater things. But, boy, will we miss them! Zion Dyson, was featured on Sunday, March 26 in the San Diego Union Tribune Arts and Entertainment section. George Varga’s article contains quotes from Zion, Gilbert, Dan Atkinson (who runs the UCSD Jazz Camp) and Mark Dresser (UCSD Jazz Faculty). We congratulate Zion on being selected and for shining a light on the youth jazz scene here in San Diego. IAJSD Students “Tore it Up” at Point Loma Nazarene College Jazz Fest! Angelica Pruitt, bass player in Rob’s 9am ensemble, received an “Outstanding Soloist” award and a scholarship to attend Parker Jazz Summer Workshop! Jason Picker performed with his school combo, Canyon Crest Academy, but we know him better as Gilbert’s 9am pianist. Jason also received “Outstanding Soloist” with a scholarship to attend UCSD Jazz Camp! Congratulations, students! We couldn’t be more proud. And, thank you, Rob, for giving these kids a wonderful performance opportunity and coaching them to success! Kamau Kenyatta receives 2nd GRAMMY! Congratulations to Kamau Kenyatta on his 2nd GRAMMY Award! Kamau received the award for his work as producer and arranger of Gregory Porter’s album “Take Me to the Alley.” This album won in the category “Best Vocal Jazz Album.” Kamau’s first GRAMMY was also on a collaboration with Gregory Porter – “Liquid Spirit” in 2014. Kamau teaches two ensembles at IAJSD. He is beloved by his students for his depth of knowledge of music and his desire for artistic authenticity. Kamau also teaches at UCSD where he was honored with the prestigious Barbara J. and Paul D. Saltman Distinguished Teaching Award. He is an incredible asset to our faculty. We are blessed to have him on board! Johnny Steele Receives YoungArts Scholarship! For the second year in a row Johnny Steele has been selected for a Young Arts scholarship. Johnny is 16 and plays in Gilbert Castellanos’ 9am combo. 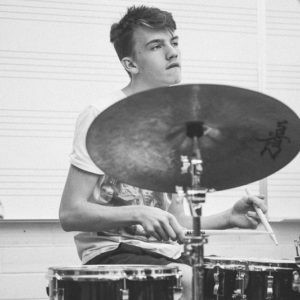 Johnny was one of 5 percussionists selected nationwide to receive an award from Young Arts and stands to win $10,000 and a chance to study with mentors in Miami, New York or L.A. His top choice is to study with Wynton Marsalis in New York. Johnny will graduate from SCPA this year, just after his 17th birthday, and plans to head off to college to continue his Jazz education. He is already getting some great news from some of the top Jazz schools in the U.S. He was accepted to The Berklee School of Music with a nice scholarship. 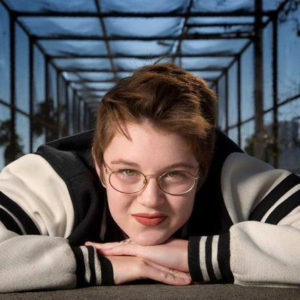 He also submitted pre-screening audition recordings to several other schools. If the college likes the pre-screening recording they invite the applicant in for a live audition. So far Johnny has passed the pre-screening at Manhattan School of Music, University of Miami Frost School of Music and USC Thornton School of Music. He will be visiting each college in January and February to interview and audition live. He is still waiting to hear from Juilliard and The New School, both in New York, and UCLA. Gilbert, Johnny’s combo leader for the past two years, knows the director of the Jazz program at the Frost School of Music in Miami and was able to arrange a VIP tour for Johnny last fall. Johnny really liked what he saw and was even able to sit in on a few classes. Gilbert also wrote a letter of recommendation for Johnny to help him with the application process. Gilbert is a firm believer in studying music at the college level, he himself has a BA from Berklee College and his master’s from Cal Arts, and has offered to help IAJSD students get into the music college of their choice. We congratulate Johnny on his tremendous accomplishments so far and are excited to see where he goes from here! Good luck on those live auditions at all those incredible schools! Eric Wesling Receives $30K Scholarship to Berklee! 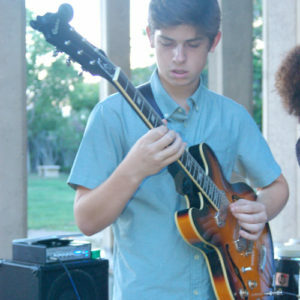 Eric Wesling is in his second year with IAJSD playing guitar. He just started his senior year at Mission Bay High School but he already has a pretty good idea where he will be going to college. This summer Eric was awarded a $30,000 per year scholarship and the prestigious Berklee College of Music! Apparently one Berklee instructor in particular saw that Eric knew what he was doing. Tim Miller spotted Eric’s talent and ability and recommended him for a scholarship to attend Berklee as a college student. I asked Eric about the scholarship. “I was awarded a $30,000 scholarship for a four year degree. The head of the guitar sessions, Kim Purlak, pulled me aside during the sound check for the final performance, and handed me the certificate. It covers tuition for two semesters, but has the possibility of being renewed if I make decent academic progress.” I am very confident that Eric will excel in this program, given his track record at IAJSD. Congratulations, Eric, on this wonderful accomplishment! We wish you every success completing your senior year of high school and wish you luck as a college student at Berklee or whever you decide to go. 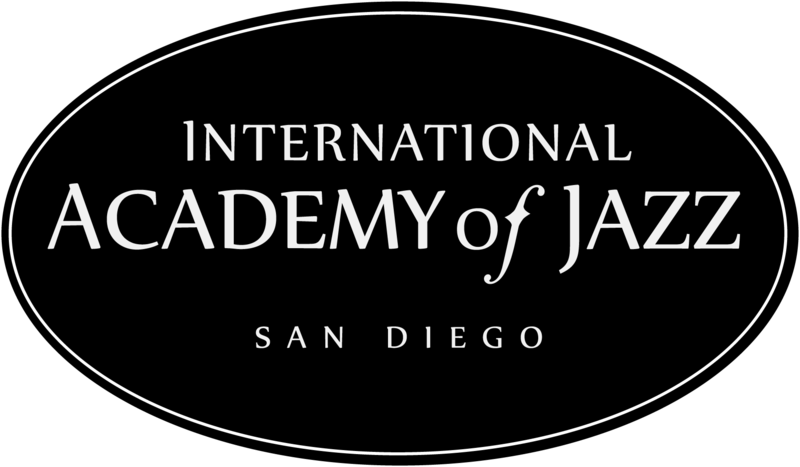 IAJ Celebrates International Jazz Day April 30th, 5:00 p.m.